First human stem cells created through cloning…thank Mitalipov’s macaques! Today is one of those days that will go down in medical and scientific history, the day that scientists at Oregon Health and Science University led by Professor Shoukhrat Mitalipov announced that they had successfully created pluripotent human stem cells by cloning skin cells. This is the first time that this has been accomplished in human cells, and is a major milestone in the developing field of regenerative medicine. It is also an achievement that rests on over a decade of careful studies of somatic cell nuclear transfer (SCNT) – the cloning technique they used – in monkeys by Professor Mitalipov and his colleagues. An article on the ONPRC News highlights the importance of research in monkeys to overcoming the barriers that had foiled previous attempts to clone primate cells. The Mitalipov team’s success in reprogramming human skin cells came through a series of studies in both human and monkey cells. Previous unsuccessful attempts by several labs showed that human egg cells appear to be more fragile than eggs from other species. Therefore, known reprogramming methods stalled before stem cells were produced. To solve this problem, the OHSU group studied various alternative approaches first developed in monkey cells and then applied to human cells. Through moving findings between monkey cells and human cells, the researchers were able to develop a successful method. While this announcement, coinciding with publication of a scientific paper reporting their work that is published in the prestigious journal Cell (1), was a surprise, the fact that the team was led by Professor Mitalipov was not. Professor Mitalipov is one of the leading experts in reproductive biology, cloning and stem cell biology, and it was only back in March that we discussed how the technique of spindle-chromosomal transfer that he developed to prevent mitochondrial disease had been approved for human trails by the UK’s Human Fertilisation and Embryology Authority. The key publication by Professor Mitalipov and his colleagues was in 2007 (2) when they reported that they has successfully produced two rhesus macaque embryonic stem cell lines through SCNT. In their 2010 commentary “Cloning of non-human primate: the “road less travelled by” “ Professor Mitalipov and his co-authors describe this study and subsequent modifications that they made to the SCNT technique to further improve its efficiency in primates. Their many modifications covered changes to the way in which the nuclei of the cells were visualised and manipulated, changes in the conditions under which the donor nucleus and enucleated egg are fused, and precise regulation of the reactivation of the fused cell. One key innovation was the use of the coat protein from the Sendai (HVJ-E) virus to improve the efficiency of cell membrane fusion between the skin cell nucleus and egg cytoplasm while prolonging the activity of a protein called maturation-promoting factor (MPF) that keeps the egg in the correct cell cycle stage to allow the introduced nucleus to integrate. Avoiding premature activation of cell division in the egg turned out to be even more difficult in human cells. Initially the technique they had used successfully in macaques failed to yield stable stem cell lines from cloned human cells, and the problem appeared to be that the eggs were still activating too quickly following fusion, but as Professor Robin Lovell-Badge of the MRC National Institute for Medical Research explained to the Science Media Centre earlier today, they were able to make an additional tweak to their method, by adding a shot of caffeine to the mix. It is worth noting that they found that while they could produce embryonic stem cell lines using this technique, macaque embryos created using it failed to develop normally when implanted into female macaques, indicating that while this technique is viable for therapeutic cloning it cannot be used for reproductive cloning. Professor Mitalipov discusses the first macaque stem cells produced through cloning in 2007. 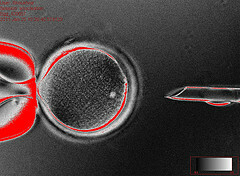 The potential uses for stem cells produced through this therapeutic cloning technique are myriad; the fact that you can take a person’s own adult cells and convert then into pluripotent cells that can differentiate into any cell type makes them ideal for many transplant purposes, ranging from bioengineered replacement tissues to genetically engineered cell transplants to cure inherited disorders, and of course stem cells created from cloned adult cells from people with a wide range of diseases can be used to create a huge range of in vitro disease models to improve our understanding of the biological process at work and hasten the development of new therapies. Of course there is already another technology that allows scientists to reprogram cells to a pluripotent state, in 2006 induced pluripotent stem (iPS) cell technology burst onto the scene and quickly became the methodology of choice for many stem cell researchers, with the first clinical trial in human patients expected to start later this year. Has human therapeutic cloning missed the boat? In an excellent commentary in Nature News on today’s announcement David Cyranoski points out that there is evidence (from studies comparing SCNT with iPS cells in mice) that cells produced through SCNT are more completely reprogrammed to an embryonic state than iPS cells. So, it is likely that each technique will have its advantages and disadvantages depending on the goal of the research…and in scientific research it is always a good idea to have more than one horse in the race. We congratulate Professor Mitalipov and his colleagues at OHSU on another stunning scientific achievement, one that will advance medicine, and no doubt be read about by students for many years to come! Posted on May 15, 2013 May 16, 2013 by EditorPosted in News, Science NewsTagged animal research, cloning, human, macaque, monkey, Oregon Health and Science University, Shoukhrat Mitalipov, stem cell.